Welcome to the second half of my card journey towards Christmas! 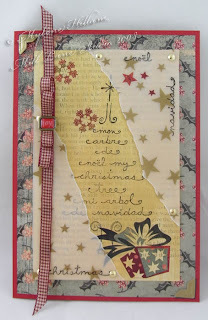 This is card number 7 using Magenta's My Christmas Tree / Mon Arbre. Yesterday I finally managed to make a card using more traditional Christmas colours and today I'm following that trend. I began this one by painting an old book page with Lumiere Metallic Gold paint and then stamped the tree image with black StazOn ink. The gold is much more.... hmmm, shall we say, gold than the photo shows and it needed to be toned down a bit. So I tore a rectangle of star-printed vellum in half diagonally and attached it with brads. That took away the large expanse of bright gold and gave me a nice background to start working with. I also stamped some of the individual words from the tree image along the vellum edges. 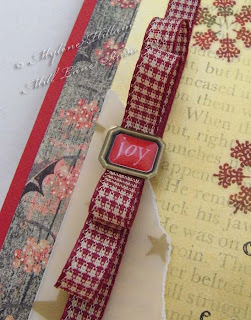 Use sticky tape to mask off the unwanted words, ink up the word you want, then remove the tape and stamp away. If your image is rubber then place it on your work surface, rubber facing up, so you'll be able to see it through the vellum. Place the vellum over the top and walk your fingers across the inked part of the image. It worked a treat on the vellum and my words are all straight! I had just bought some Basic Grey papers and matching rub-ons this week and they were perfect for toning down that bright gold. I added a few of the red stars to the gold star vellum, and a couple of snowflakes and a gift package to the painted book page. Along the side of the card I added a length of ribbon (Kaszazz) which is looped over and over to create a bow and then topped that with an epoxy sticker, also from Basic Grey - a nice finishing touch! The holly leaf background paper looks a little grey in the photo but it's actually more like sage than grey and although the images are quite modern, the card has a somewhat vintage feel about it. Vintage or not, I'm still calling this traditional red, green and gold! I like this one a lot - there's tearing,there's brads, there's ribbon ... all the things I like!